Last week we reported we'd read a second tag on Kiholo, a turtle who'd travelled all the way from the Big Island of Hawaii to our dive site at Honokowai. We were able to make out half of the first digit and figured it was a 1, and easily read the last two: 06. With two tags read, George Balazs was able to share historical information on this very special turtle. Kiholo was first tagged in March 1989 and has been resighted twelve times since--the last being October 1996. Now almost three years later, Kiholo is sighted at Honokowai. This animal should have stayed in Kiholo Bay. Of the hundreds of turtles George and his team have pulled from that area, none have ever had tumors. Kiholo Bay on Hawaii's Kona Coast is fibropapilloma free. Sadly, Kiholo is now sick. 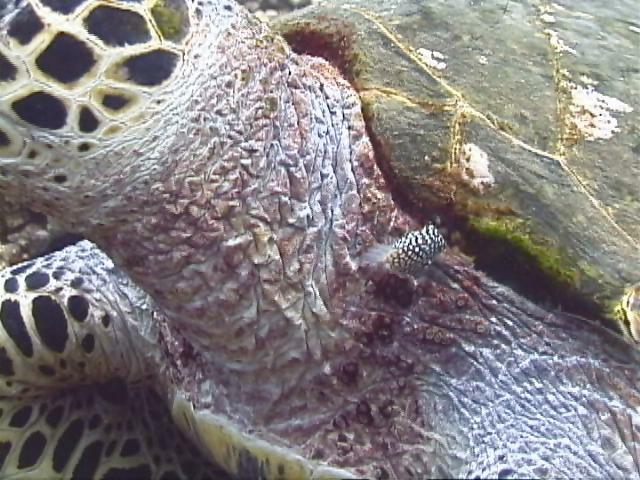 The posterior of the turtle's left eye is showing a pre-eruptive tumor and white spots fleck his neck, a possible harbinger of a tumor collar. We have little doubt that if Kiholo stays at Honokowai, his condition will worsen. The Hawaiians call Hawksbills 'ea. The shell of this turtle was used as medicine by the Hawaiians for a disease called 'ea. So this turtle is defined in human terms--that is, how useful it is to people! Keoki and Ake are hawksbills. With each encounter we get more insights into the lives of these strange strange ducks. This week we've seen them eat Hypnea musciformis, a red seaweed growing profusely along the West Maui coastline. We've documented Canthigaster jactator cleaning/biting them just like they do the green sea turtles. Yet there's no hint of the tumor disease on these turtles. The new barnacles we've called Clingons don't bother the hawksbills the way they infest the greens, either. 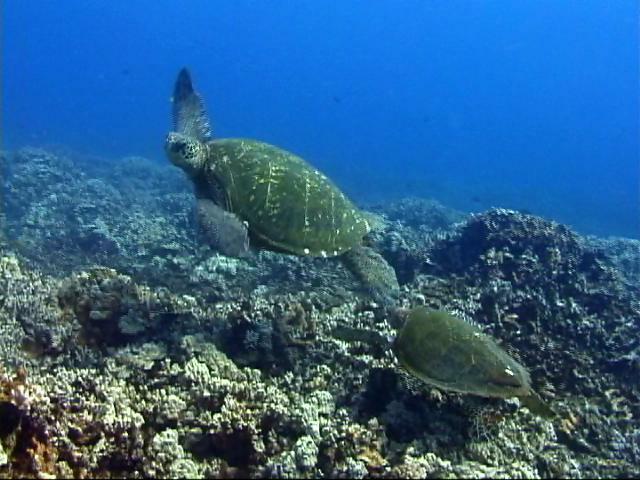 So blemish free are Keoki and Aki that if we were to name this species of turtle we'd call them... call them... HEY! What's the Hawaiian word for Teflon? We've been featuring a Pic of the Week illustrating the most interesting thing that happened in the previous seven days. (Okay, mostly they've been video captures, but you get the picture.) This week, though, we need more than one image. So here's the play by play. 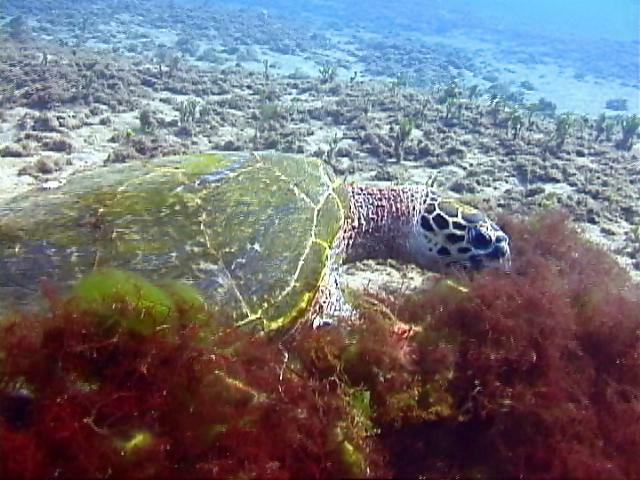 Keoki the Hawaiian hawksbill was swimming downcurrent foraging for a tastie. A large honu was resting in her path. This promised to be interesting. At no time did Keoki try to bug the honu--she was just intent on swimming in the straightest line possible. 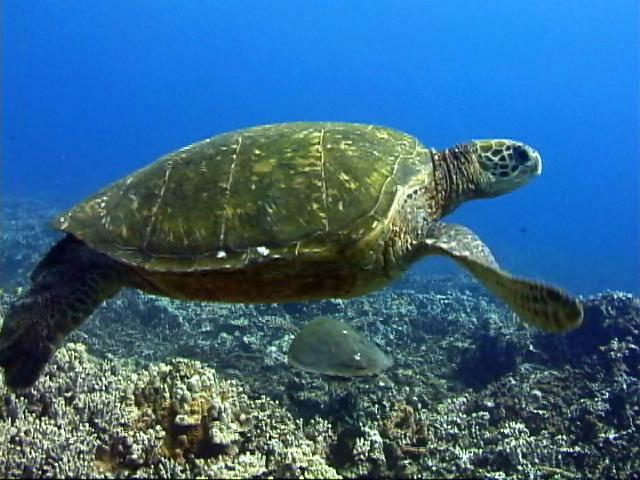 The honu, however, took one look and lifted. Keoki continued on her way. 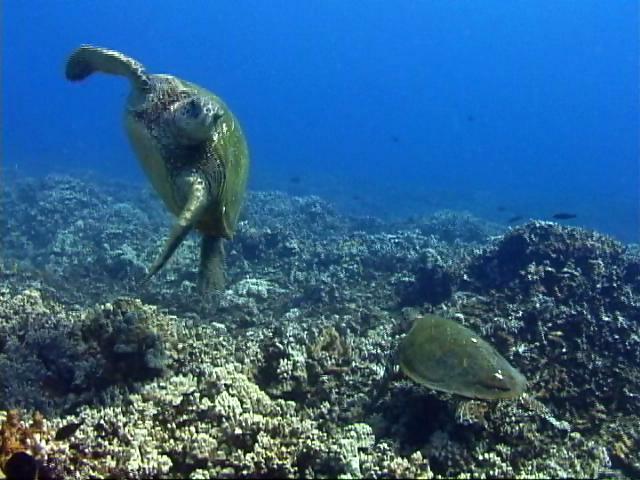 The honu, however, took one look and lifted. 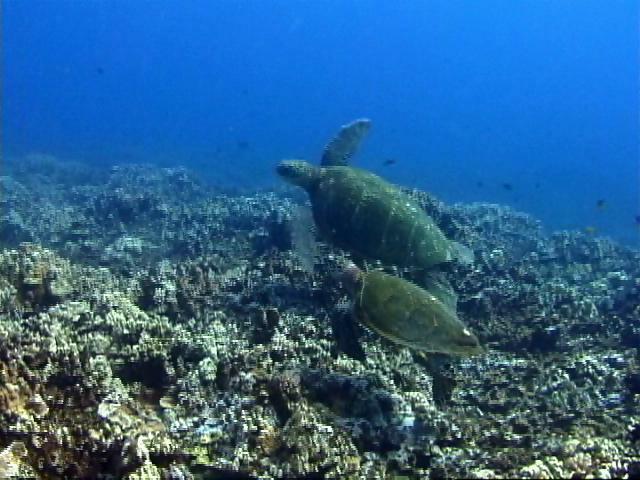 This put the hawksbill in line with the honu's rear flipper. The honu, probably expecting a snap from that beak, leapt out the way and veered as only a honu fearing its flipper nipped can do. Keoki just swam on, ignoring the honu as it did from the very beginning.